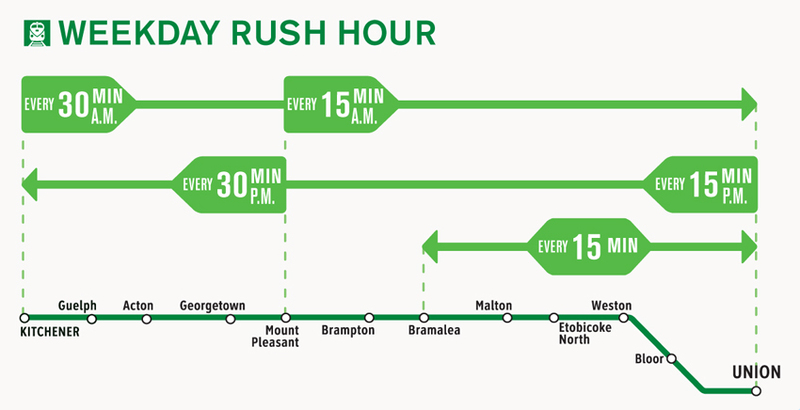 Today, GO Transit’s Kitchener line provides weekday rush-hour train service between Kitchener-Waterloo and Toronto. Trains run east in the morning and west in the afternoon. Through its Regional Express Rail project – better known as GO expansion – Metrolinx is already starting to transform the existing GO rail system from a commuter service to a whole new rapid transit experience for your community. Average times between trains are shown. Actual times may be shorter or longer depending on location and departure time. *Express service will be offered from Bramalea to Union Station in the morning and from Union Station to Bramalea in the afternoon/evening.